Today, unlike the past, the dangers and health issues of smoking are well known. While smoking seems to have been much more widespread in the past, with more knowledge of smoking side effects varying types of smoking bans have been put in place across the United States. Regardless of whether you’re a smoker or not these bans are sure to either limit your ability to smoke or provide a much desired smoke free environment. Simply put these bans and legislation that differ from state to state impact both patrons as well as small business owners that operate restaurants and offices, entertainment type settings such as clubs, bars, casinos and even theaters and public places including stadiums, government buildings and more. What follows below is a comprehensive guide to no smoking signage requirements at the state level. Before we jump into the state by state guide to smoking signage laws we’ve addressed some of the most commonly asked questions around smoking legislation and bans. Are Smoking Cessation or Quit Smoking Programs The Same As Smoking Bans or Smoking Laws? In short, no. While there are similarities or even a common end goal smoking cessation programs are very different from smoking bans or laws. Smoking cessation or quit smoking programs (commonly called “quitting programs”) can be funded by federal, state or even local money. There are also private addiction recovery programs that operate on a for profit basis as well as nonprofit programs run by churches and other similar minded organizations. There are also other methods such as nicotine gum, nicotine patches, etc. The end goal of these programs and products is both to show people how to stop smoking and effectively help individuals achieve this goal. Whether it is through a 12 step program or other methods these programs are widespread and can vary greatly in funding, administration, tactics, etc. Smoking bans or smoking laws (even called “tobacco laws” on occasion) on the other hand are actual legislative acts or statutes put in place at a state or local level that prohibit or regulate smoking. While it could be argued that these are one in the same as it often helps people stop smoking, the primary purpose of such bans is to protect non-smokers from the dangers of secondhand smoke while simultaneously allowing smokers a designated area to smoke. More on smoking laws is described as part of this FAQ section below as well as detailed extensively in the state by state guide section. What Are The Rights of The Smoker and Non-Smoker? Any kind of legislation regulating how individuals act is bound to be a difficult and complex issue. Surprisingly with smoking laws there hasn’t been as much push back from smokers as there has been with other similar laws that seemingly seek to protect one group from the acts of another. This is evidenced by the fact that over half, 28, of states have statewide smoking bans in all enclosed places. Alternatively, only 10 states do not have some kind of ban in place. The twenty eight figure also includes any who have banned smoking in restaurants and bars. The number is even higher when bars and restaurants are excluded as these are often exempted to some degree. Without a doubt the momentum is in favor of smoking bans as more and more states adopt legislation regulating or outright prohibiting smoking. Nonetheless there are advocates of both smoker and non-smoker alike. Smoking bans often are worded in a way that gives some liberty to owners and operators to designate smoking areas for those who wish to smoke. This wording can at times be very detailed to ensure that smokers have the right to smoke while non-smokers are protected from secondhand smoke. For example, some states stipulate that smoking areas not only be posted with signage and separated from non-smoking areas but also include structurally different ventilation systems to prevent the breathing of secondhand smoke. In general, most states attempt to provide some kind of solution that placates both smokers and nonsmokers alike. The debate on the efficacy of such laws and personal liberty is an unsettled question not only in relation to tobacco laws but other similar statutes, ordinances and laws that attempt to regulate personal behavior and choices. Do Smoking Laws Exist at the Federal, State, County or City Level? Currently no federal law exists that bans or regulates smoking for the entire country. Though there are certain federal regulations including no smoking on commercial flights and and interior places owned, rented or leased by the Executive Branch of the Federal Government. At the state level many states have adopted a full ban of smoking with varying stipulations based on setting and location. Some of these states require all places to adhere to the state law while other states allow local governments in counties, cities and towns to enact more stringent laws permitting or forbidding smoking. Are All Statewide Smoking Bans/Laws The Same? No. In fact, not only do some states have no bans at all but those that do have smoking laws in place can and do vary greatly. The most common elements of those states that do have a ban include the following: workplaces are the most commonly banned or protected areas, a number of them have laws that were amended from earlier laws, the structure of the laws themselves are often similar in nature and many of them have wording or sections explicitly protecting children, hospitals, public or government buildings, schools, etc. One of the other big differences from state to state is whether the state law preempts (or disallows or overrules) a local law or ordinances. In states that do not preempt local laws localities are free to create, pass and enforce more stringent smoking laws at the county or city level. Alternatively some states explicitly declare that the state law overrules any local laws. What About Electronic or E-Cigarettes? Are They Included In Smoking Bans/Laws? This answer is less straightforward than most of the others. Simply put, yes and no. Some states with more recent laws have built in explicit language banning not just the traditional cigarette but anything of the like nature that produces the secondhand smoke (and potential nicotine addiction) that is so dangerous to nonsmokers. Many other states, whether because the law is older or because they simply haven’t decided how to approach the issue, have no explicit language regarding e cigarettes or similar products. Undoubtedly moving forward e cigarettes, vape bars, tobacco-less cigarettes and similar products and places will start to be addressed by more and more states through amendments to existing law or new laws altogether. Who Enforces These Laws and What Are the Penalties? Not surprisingly enforcement of smoking bans can and does vary from state to state. Enforcement is either delegated to local or state authorities depending on the level at which the law is passed. Further, many states write into the law that the appropriate state or local Department of Health is tasked with both educating and enforcing such laws or bans. Both for smokers and owners and operators who are obligated to adhere to the law the most common penalty are citations and monetary fines. These vary greatly from state to state and can usually be found within the actual statute or law or through the Department of Health’s section on the smoking ban or law. Is the State Law Sufficient for Employers or Are Company Smoking Policies Needed? While it may seem repetitive this also varies state by state. Having said that most states who regulate smoking in public workplaces through a statewide law usually require the employer to not only post smoking signage but also have some kind of explicit company policy. Often, this policy not only has to be provided to employees upon hire but sometimes communicated to them pre-hire. Employers who don’t comply with these regulations can be fined and even lose legal protection by not adhering to the law. I Have to Post Smoking Signage – Where Can I Get Signs / Are Smoking Signs Free/Printable? The focus of our state by state guide is smoking signage requirements. Almost all smoking bans require some kind of signage at the state or local level. In a number of cases the respective Department of Health provides a compliant smoking sign section that allows owners and operators to order signage online. Some of these cost money while others provide them for free while supplies last. 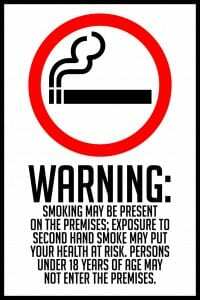 Others simply provide downloadable or printable smoking signs that can be used throughout the premises after being printed on an everyday office printer. 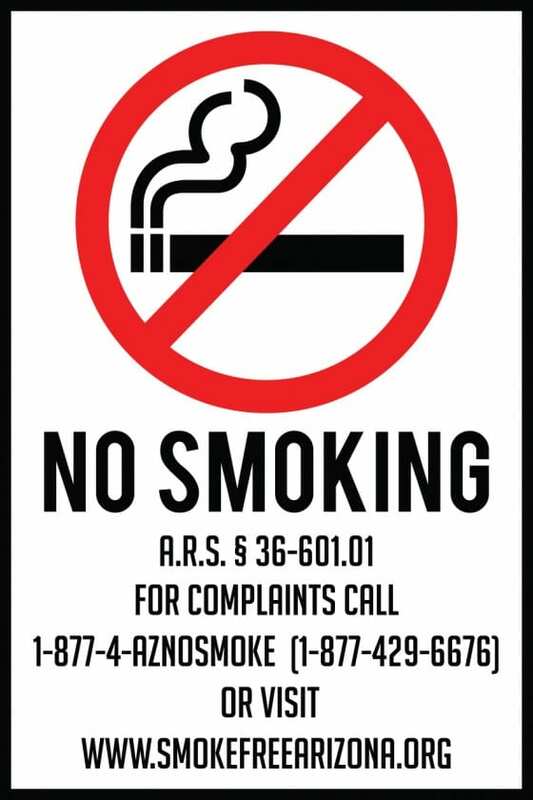 In putting together our guide for signage laws and requirements we have also included customizable templates as seen below in the state by state section that can be ordered and used to comply with smoking laws. Some of these templates include decals (like stickers) as well as aluminum templates though any of them may be changed to the desired material after clicking on the template. Those customizing and ordering signs through this post should still verify with applicable state and local authorities that signage meets the appropriate code or statutes’ requirements. By ordering signs through a third party vendor owners and operators are more likely to get a longer lasting and more professional sign then a free poster through a Department of Health. 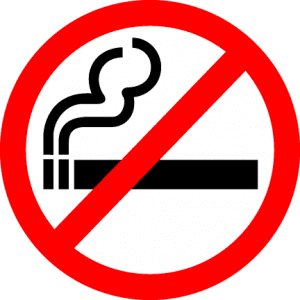 What is the International No Smoking Symbol/Sign? 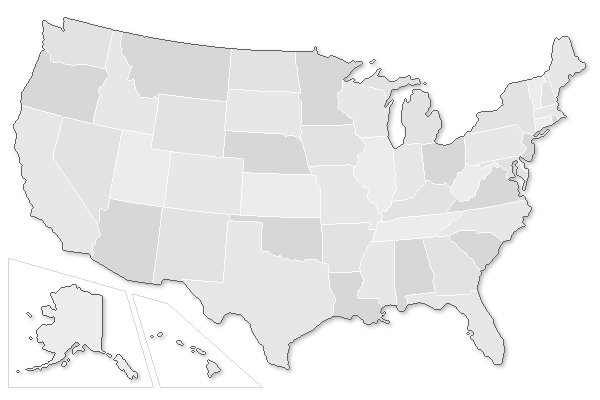 One of the best resources for no smoking bans on a state by state basis is Wikipedia. This outlines all the minor and major differences across the 50 states, background on legislation of the respective bills and much more. Not only does it detail all of this but it is constantly updated by an army of volunteers as the “no smoking landscape” continually changes as legislation is updated or voted upon. Thus, our resource will not focus on every specific of the actual laws or bans themselves but rather include a brief overview of the law and primarily focus on the signage requirements of each state for those who are in a situation where no smoking signage is needed to comply with a state or local law. So if you’re a restaurant owner or operate and manage any location that requires no smoking signage then click the map below for your state and read the requirements as to how the signs should be posted and what should be on the signs. All of the templates in this guide are customizable by clicking on them. Alabama current does not have a statewide ban on smoking but does have a state law called the Alabama Clean Indoor Air Act (“ACIA” — found in Title 22 Chapter 15). 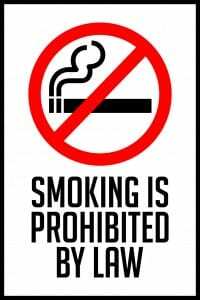 The act in large part forbids smoking in public places and meetings but not bars, lounges and other spaces. Local governments may create more exacting laws. Signage requirements can be found in the Code of Alabama in Section 22-15A-5 to 7. They are detailed below. 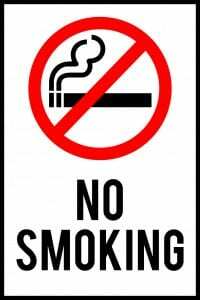 For locations that do not have smoking prohibitions (bars, lounges, retail tobacco stores, tobacco businesses, private hire limousines, chemical dependency or mental health programs) any no smoking areas must be designated as “no smoking” rooms. In the treatment center locations the ability to prohibit smoking is based on the fact that it would interfere with treatment administered and can be allowed in separate areas. (15A-4) There are also places and locations that can not be smoking areas and are outlined in 15A-6. “(a) A “No Smoking” sign or signs, or the international “No Smoking” symbol, which consists of a pictorial representation of a burning cigarette enclosed in a circle with a bar across, shall be prominently posted and properly maintained where smoking is prohibited by this chapter, by the owner, operator, manager, or other person in charge of the facility. 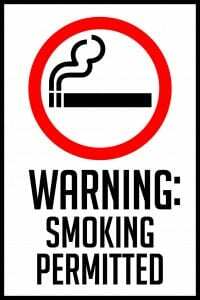 “Smoking Area” signs shall also be posted as appropriate in public places. As noted local governments can (and have in some cases) have their own legislation as is noted in 15A-10 which states: “Nothing in this chapter shall be construed to restrict the power of any county, city, town, or village to adopt and enforce local laws, ordinances, or regulations that comply with at least the minimum applicable standards set forth in this chapter.” Thus, owners and operators need to verify that signage complies with both state and/or local smoking laws as applicable. Like Alabama, Alaska does not have a statewide smoking ban. Though in general Alaska does either regulate smoking through signage or outright prohibits smoking in certain public places through this law. Details of the Alaska smoking law are found in the Alaska Statutes in AS 18.35.300. This law doesn’t specify whether local governments can enact their own laws or not. Due to this fact a number of localities have chosen to enact their own laws. Smoking regulations or prohibitions must be clearly stated with posted signage. These signage requirements are outlined in 18.35.330 and summarized below. For areas that have both smoking and non-smoking areas the person in charge needs to clearly display and communicate these areas to both parties. In both of the cases above, signage must be at least 18” wide and 6” high. The lettering on the signs must be at least 1.25” high. Owners and operators should verify that no stricter local ordinances or laws exist when creating and posting no smoking signage in Alaska. For a decal, click on the the image below and change the “Sign Type” to window decal. Arizona has a statewide smoking ban that became effective on May 1, 2007. It is called the Smoke Free Arizona Pact (Smoke-Free Arizona Act § 36-601.01). This prohibits smoking inside all enclosed workspaces and within twenty feet but does include some exceptions. The Act neither supersedes nor restricts existing local ordinances or local governments from creating their own ordinances or laws. 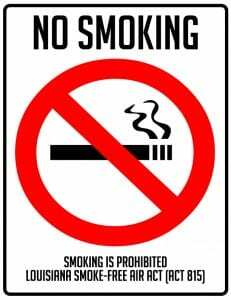 Signage can either read “No Smoking” or use the international “No Smoking” symbol (“pictorial representation of a burning cigarette enclosed in a red circle with a red bar across it”) and need to be “clearly and conspicuously” posted wherever smoking is prohibited. 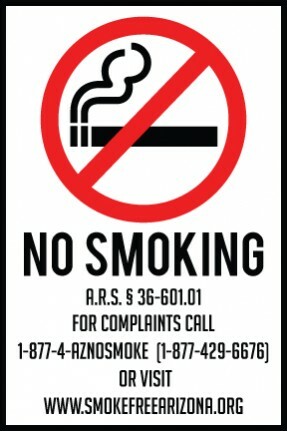 Signage must include the telephone number and website for making complaints: 1-877-4-AZNOSMOKE, 1-877-429-6676 and http://www.smokefreearizona.org/. Lettering must be legible from a distance of five feet (three feet for vehicles). Signs must be no smaller than 4”x6” and 2”x3” for vehicles. 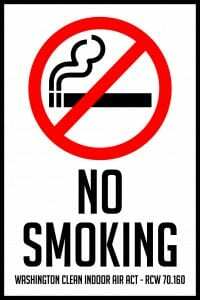 Public places of employment which prohibit smoking need to post signage at every entrance stating the prohibition. Since the state law allows local governments to create their own stricter laws if they wish, owners and operators should verify that no additional signage requirements at the local level are needed when posting no smoking signage in Arizona. The first two images below are for decals. Arizona state law requires the minimum dimensions above. Though these are slightly bigger due to the minimum size (6″x6″) required of our printers. The third sign is an aluminum sign but can be changed to any material desired after clicking. 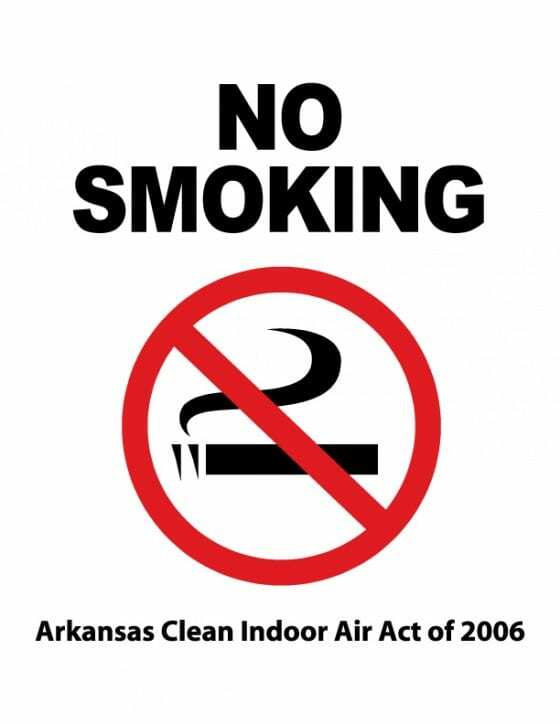 The state of Arkansas does have a smoking ban for all enclosed workplaces but has a number of exemptions to the ban. 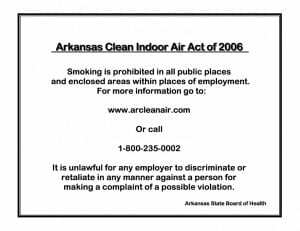 This is called the Arkansas Clean Indoor Air Act of 2006. They also have the Arkansas Protection from Secondhand Smoke for Children Act of 2006 to protect children in cars from secondhand smoke. Local governments can enact more stringent laws and ordinances if they wish. “(a) “No Smoking” signs or the international “No Smoking” symbol consisting of a pictorial representation of a burning cigarette enclosed in a red circle with a red bar across it may be clearly and conspicuously posted by the owner, operator, manager, or other person in control in every public place and place of employment where smoking is prohibited by this Rule. 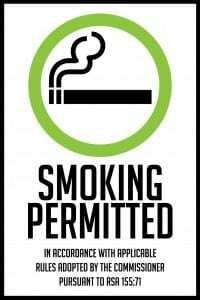 (1) In any restaurant or bar where the owner or operator exempts itself from the provisions of this Rule, the employer or person in charge shall post signage at all entrances and wherever else necessary to clearly describe smoking is allowed. 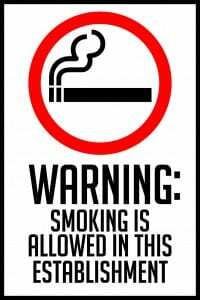 (2) All signs used to describe that smoking is allowed shall be at least 11 inches wide and 8 1/2 tall and be clearly and conspicuously placed at a height and location easily seen by a person entering the establishment and shall not be obscured in any way. THIS IS A SMOKING AREA. PART OF THE ESTABLISHMENT AT ALL TIMES. inch high and 1/2 inch wide. high and 1/4 inch wide. in capital letters at least 1/8 inch high and 1/8 inch wide. Those in control of a location in which they wish to permit smoking in a designated area or simply need to comply with Arkansas’ smoking law should verify that no stricter local laws are applicable to their establishment. California was one of the first states to enact a statewide smoking ban in all enclosed workplaces. Like many other state bans this law includes many exemptions for specific locations and situations. (This is a great overview of these exemptions.) It is also against the law to smoke within 20 feet of a public building and in a moving vehicle with a minor (18 years or younger) in the car. These additional smoking laws were added after the original one became effective January 1, 1995. Local governments can choose to enact stricter laws if they desire. Details of the California state smoking law are found in the California Labor Code Chapter 3 Sections 6400-6413.5. Smoking details in particular start in 6404.5.
entrance to the building or structure. The above signage requirements along with other efforts can help absolve employers from smoking by non-employees and employees. As far as we can tell there are no other no smoking signage requirements at the state level other than those listed above. Business owners should verify that there aren’t other signage requirements at the county or city level to ensure they are complying with all applicable smoking laws in California. Colorado’s statewide smoking ban is called the Colorado Clean Indoor Air Act. It became effective on July 1, 2006. The state has built in exceptions to the smoking ban for some locations and vehicles under certain circumstances. Local governments in Colorado can put in place their own more stringent ordinances if they want. SmokeFreeColorado has many good resources on the Act, a summary, enforcement and more. Details of the law are in the Colorado Revised Statues in 25-14-201 to 209. In other words, as long as it is definitely not prohibited in Colorado’s list of restricted locations owners or managers can post signs to clearly designate smoking and non-smoking areas. 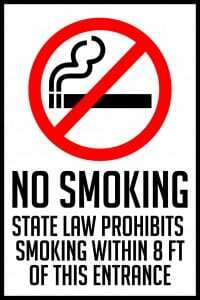 Like other states that allow local governments to create ordinances it should be verified that signs comply with any appropriate local laws in addition to the Colorado smoking laws. The Clean Indoor Air Act is found in the Connecticut Statutes in Sec. 19a-342. 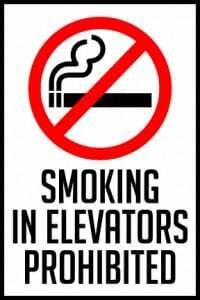 One can be arrested for smoking in a passenger elevator if a sign is posted stating that smoking is prohibited by state law. These signs need to be visible to both employees and visitors. Like the requirements above employer designated smoking areas must be clearly marked with signage and comply with state and federal ventilation standards. 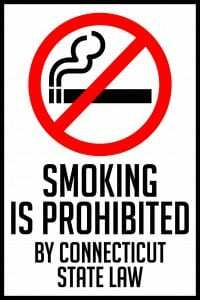 Because the state law preempts the ability of local governments from creating their own laws owners and operators should be able to simply comply with the above requirements when posting no smoking signage in Connecticut. 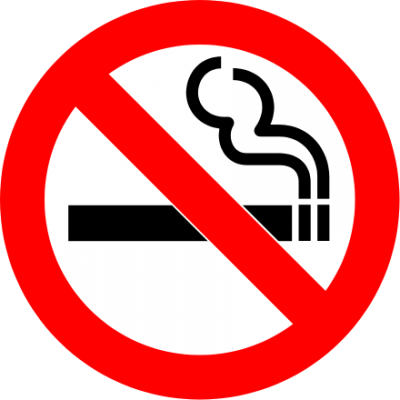 Delaware’s smoking ban, the Clean Indoor Air Act, went into effect on November 1, 2002. Like most other states with bans it prohibits smoking in all enclosed workspaces with exceptions built into the Act. Local governments in Delaware are able to enact more stringent ordinances if they see fit. The actual Act is found in Delaware Code Title 16 Chapter 29. Delaware’s smoking law has one of the most straightforward signage requirement sections of all fifty states. Nonetheless, owners and managers should still confirm that they are in compliance with any county or city ordinances outlining no smoking signage requirements. Florida also has a statewide ban with specific exclusions. The ban went into effect on July 1, 2003 and was an amendment of the 1985 Florida Clean Indoor Air Act (FCIAA). Like Connecticut, city and county ordinances are preempted by the State law. Thus, they are unable to enact their own laws prohibiting/allowing smoking. “(1) The proprietor or other person in charge of an enclosed indoor workplace must develop and implement a policy regarding the smoking prohibitions established in this part. The policy may include, but is not limited to, procedures to be taken when the proprietor or other person in charge witnesses or is made aware of a violation of s. 386.204 in the enclosed indoor workplace and must include a policy which prohibits an employee from smoking in the enclosed indoor workplace. 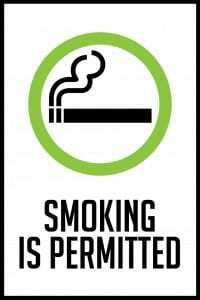 In order to increase public awareness, the person in charge of an enclosed indoor workplace may, at his or her discretion, post “NO SMOKING” signs as deemed appropriate. (2) The person in charge of an airport terminal that includes a designated customs smoking room must conspicuously post, or cause to be posted, signs stating that no smoking is permitted except in the designated customs smoking room located in the customs area of the airport. Each sign posted pursuant to this section must have letters of reasonable size that can be easily read. The color, design, and precise locations at which such signs are posted shall be left to the discretion of the person in charge of the premises. Because Florida’s smoking law preempts local laws owners and operators should only need to comply with the above signage requirements for no smoking signage for Florida locations. Georgia’s statewide smoking ban became effective on July 1, 2005. It is called the Georgia Smokefree Air Act of 2005 and has a number of exemptions. Local governments can enact stricter ordinances and many counties have done so. Owners and operators should not only verify what constitutes Georgia’s state smoking law but also applicable local laws or ordinances to ensure posted signage meets requirements. Hawaii enacted a statewide ban of smoking in enclosed and partially enclosed workspaces on November 16, 2006. For prohibited areas or locations smoking is also prohibited within 20 feet of entrances/exits. There are exemptions to this statewide for certain locations and situations. Specific Hawaii counties can put in place more stringent smoking laws than the statewide ban. At least a couple of counties have done so. The Hawaii smoking ban (“HRS328J”) is found in the Hawaii Revised Statutes Title 19 Chapter 328J and more specifically in 328J-1 to 328J-15. Despite the law, owners, operators and managers can make any area as no smoking assuming they adhere to the signage requirements listed below. In addition to Hawaii’s state smoking law owners, operators and managers should also verify that there are no other county or city requirements or laws for the place in which they are in control of. Idaho’s Clean Indoor Air Act became effective on July 1, 2004 and bars smoking in all enclosed public places minus a list of exceptions. Idaho counties and locales are able to put in place tougher laws if they wish. Boise, Idaho is one of the places that has chosen to do this. Idaho’s Clean Indoor Air Act is found in the Idaho Statutes Title 39 Chapter 55. In general Idaho’s smoking law builds in the possibility of providing smoking and smoke free areas assuming the person doing so doesn’t supersede the state or local law and also meets all other requirements. Apart from the specific signage examples listed above there is no direct language of signage requirements for designated smoking or non-smoking areas. I.e. for employers. Thus, we would recommend verifying with state or local officials to ensure all laws are complied with. 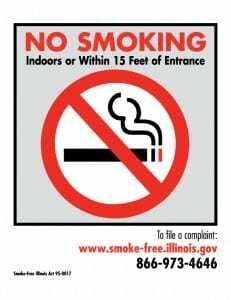 The commonly known name of Illinois’ smoking ban is the Smoke Free Illinois Act. 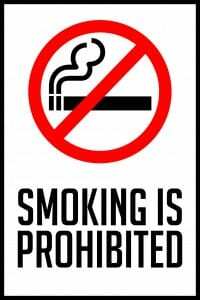 It went into effect on January 1, 2008 and bans smoking in all enclosed workspaces and a variety of other places. It seems to have fewer exceptions than most other states. For example, the ban includes bars, restaurants and casinos which in most states (bars and casinos) usually have some kind of exemption built in to the state law. 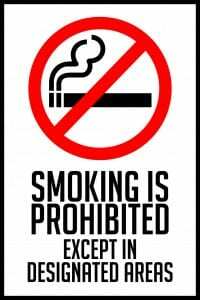 There is also a 15 foot smoking restriction applicable to any location that forbids smoking inside. Local governments within Illinois are able to enact stricter laws and ordinances. The actual Smoke Free Illinois Act is found in the Illinois Compiled Statutes Title 410 Chapter 82. It is commonly referred to as 410 ILCS 82. “(a) “No Smoking” signs or the international “No Smoking” symbol, consisting of a pictorial representation of a burning cigarette enclosed in a red circle with a red bar across it, shall be clearly and conspicuously posted in each public place and place of employment where smoking is prohibited by this Act by the owner, operator, manager, or other person in control of that place. 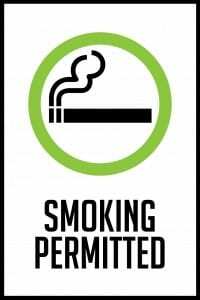 Other areas that are not covered in the statewide act can still be designated as non-smoking areas assuming that the person in full control follows the guidelines above and posts the signs conspicuously. There doesn’t seem to be any specific language for signage for those seeking to designate a smoking area. Regardless, those in control should verify with appropriate levels (i.e. Illinois smoking laws as well as potential local ordinances) that their smoking signage is in compliance with applicable laws. Indiana’s smoking ban was only recently signed into law and became effective July 1, 2012. It excludes bars and casinos and many other locations. The most recent law (“Prohibition on Smoking”) replaces an earlier law entitled “Clean Indoor Air Law”. 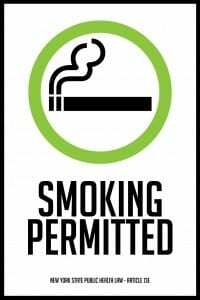 The current ban includes an 8 foot smoking prohibition for any location that also bans smoking on the inside and generally covers enclosed public places and work environments. Local governments within Indiana are free to enact stricter laws. With a variety of cities, counties and Universities enacting their own ordinance or law Indiana has taken advantage of this more so than possibly any other state. Further details and resources can be found on the Indiana State Department of Health Smoke Free Air Law section. The new full law is found in Indiana Code Title 7.1 Article 5 Chapter 12. “…post conspicuous signs at each public entrance that read ‘State Law Prohibits Smoking Within 8 Feet of this Entrance’ or other similar language.” For example: “Smoking is Prohibited By State Law”. The posting of signs at each entrance/exit is also required of restaurants. As per the note above with so many local governments enacting stricter smoking laws those in charge should verify they are complying with all applicable ordinances/regulations beyond just the Indiana smoking law at the state level. Iowa, like many other states, has a statewide ban that prohibits smoking in workplaces and other places including bars and restaurants. Likewise, it also has a number of exemptions to the statewide ban. 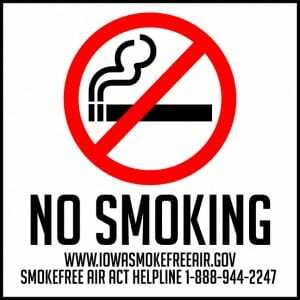 The act became effective on July 1, 2008 and is called the Smokefree Air Act. The actual Act is found in the Iowa Code – Title IV Chapter 142D. Further requirements include the requirements that non-vehicle signs be at least 24 square inches and vehicle signs 9 square inches. The copy of the sign must be in a legible font. As far as we can tell there is no specific language whether local governments can or cannot enact their own ordinances. As such, those in control of locations and looking to designate specific areas should verify with applicable authorities to make sure they meet all requirements of Iowa’s smoking laws. For a decal instead of an aluminum sign, click on the the 2nd image below. Though both can be changed to any sign type after clicking. Kansas has had a statewide smoking ban since 1987! In 2012 an amendment was added to the existing law that for all intents and purposes bans smoking in all indoor, enclosed workspaces in Kansas. It also covers a 10’ radius around any entry of public buildings. There are a variety of exemptions including at the very least casinos and racetrack gaming floors. Local governments of Kansas are free to enact more detailed laws as they see fit but these local ordinances have not come without challenges by those impacted by the ban. The actual law itself is found in Kansas Statutes Chapter 21 Article 61 Section 6109 – 6116. Kansas Smoke Free is also an excellent resource for information on the Act. No specific language for signage is given for those wishing to designate smoking areas. Due to potentially more stringent local laws and enforcement those posting signage should verify and consult with local authorities as to applicable laws beyond the state level Kansas smoking laws and what will be deemed “conspicuous”. Kentucky, unlike many other states, has not officially adopted a statewide ban on smoking. Though this doesn’t mean that there are no smoking laws or prohibitions throughout the state. At the very least public and government buildings are non-smoking except designated areas. Schools are also smoke free. Attempts to enact a statewide ban on enclosed workspaces, restaurants and bars have failed in recent years. Not surprisingly due to the absence of a statewide Kentucky law many localities have put in place their own ordinances regarding smoking prohibitions. Signage requirements, if any, should be verified with local authorities and officials. The state of Louisiana has a statewide smoking ban that has been effective since January 1, 2007. The ban excludes bars and a number of locations and situations. Local governments can create their own laws and ordinances related to smoking prohibitions. The Louisiana Campaign for Tobacco-Free Living website has lots of good information as well. 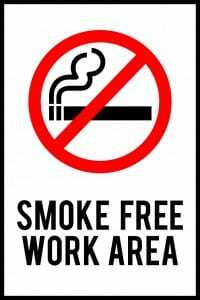 Owners or managers can make outdoor areas at places of employment smoke free by posting signs prohibiting smoking despite the exemption of outside areas. (RS 40:1300.256). No other specific language is found for creating smoking or non-smoking areas by owners or managers. Regardless, owners and managers should verify signage is in accordance with local ordinances as well as any other Louisiana smoking laws that may apply. Similar to Kansas, Maine had existing smoking laws since as early as 1985 (and 1999). The most current statewide smoking ban expanded these previous laws and became effective on January 1, 2004. The ban prohibits smoking in all public places, workplaces, bars and restaurants. It also prohibits smoking in cars when a minor under 16 years old is present. Like almost all other statewide smoking bans it includes exempted areas. The current law neither permits nor disallows local governments from enacting their own ordinances. To date, not local government has enacted their own laws. Unlike other states there is no common name for the law but it is found in the Maine Statutes in Title 22 Chapter 262. The Maine law is concise and easy to understand compared to some states. Further, outdoor eating areas of restaurants need to post signage according to the same guidelines stated in section 1543. With no local ordinances nor specific language related to creating designated areas the state law above seems to be the be all end all (at least for now) of Maine’s smoking prohibitions. Nonetheless, owners and operators would do well by verifying with local and/or state offices when posting signage. Maryland has a comprehensive statewide smoking ban that started on February 1, 2008. It is called the Maryland Clean Indoor Air Act of 2007. While it does have some exemptions, just like almost every other state with such a ban, it prohibits smoking in public places, enclosed workplaces, casinos, restaurants and even private clubs. Here is a quick primer that is easy to understand: The Maryland State Clean Indoor Air Act – A Guide for the Public. The Maryland Department of Health and Mental Hygiene also has a section on the Clean Indoor Air Act. “A. 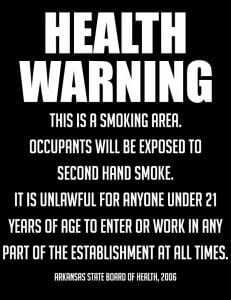 An indoor area open to the public and every public entrance to an indoor area open to the public where smoking is prohibited under Regulation .05A of this chapter shall display conspicuously a “NO SMOKING” sign that conforms to the requirements of Regulation .06E of this chapter. (3) The letters “SMOKING PERMITTED IN THIS ROOM” on the sign are a minimum of 1 inch in height. C. An indoor area open to the public and every public entrance to an indoor area open to the public where smoking is prohibited in a hotel or motel shall display conspicuously a “NO SMOKING” sign that conforms to the requirements of Regulation .06E of this chapter. D. A vehicle where smoking is prohibited under Regulation .04A(4) of this chapter shall display conspicuously a “NO SMOKING” sign that conforms to the requirements of Regulation .06E of this chapter. Due to the fact that local governments can choose to implement stricter regulations it is recommended that owners and operators consult or contact their local officials to ensure signage meets all applicable codes. Massachusetts’ statewide smoking ban was implemented on July 1, 2004. It generally prohibits smoking in all enclosed work and public places as well as bars and restaurants. Notwithstanding, the ban includes a number of exemptions that allow smoking in a variety of locations and situations. Local governments and boards of health are able to further regulate smoking and some, including Boston, have done so. The Massachusetts Department of Public Health also has lots of resources on the smoking ban. “(4) Every area in which smoking is prohibited by law shall have “no smoking” signs conspicuously posted so that the signs are clearly visible to all employees, customers, or visitors while in the workplace. In general, smoking areas in a non-smoking environment shall “be conspicuously designated” as such. In most cases this requires not only posted signage but also signs posted at entrances/exits as well as within the room itself in visible places. We assume this means according to the signage requirements outlined above. Some specific situations are detailed below. Despite the detailed requirements listed above, due to the fact that local governments can enact stricter smoking regulations owners and operators should verify with appropriate locales to ensure signage posted meets applicable requirements. Michigan’s statewide smoking ban has been effective since May 1, 2010. The prohibition includes all enclosed workplaces and also includes bars and restaurants. Unlike many other states it also includes hotels and motels. It has fewer exemptions than most states and allows smoking in a few select locations and situations. It is commonly known as the “Dr. Ron Davis Smoke Free Air Law” or simply the “Dr. Ron Davis Law”. There’s a good summary here and more resources here. The Michigan smoking law itself doesn’t say whether local governments can put in place their own laws but does state that they cannot put in place any rules different from the state law. The law is known as House Bill No. 4377 or Act 188 or MCL 333.12603 which was an amendment to Act 368 of 1978 in 333.12603 in the Michigan Compiled Laws. Simply put, owners and operators need to have a recognizable no smoking sign both at entrances/exits and throughout the location in which they are prohibiting smoking. Michigan, perhaps more than any other states, makes it extremely difficult to find the actual text of the law and the requirements of the law. Further, it is difficult to ascertain whether local governments can or cannot enact stricter ordinances. As such, those posting no smoking signs or signage should verify both with local and state offices for requirements. Minnesota’s statewide smoking ban is called the “Freedom to Breathe Act” or “Minnesota Clean Indoor Air Act”. It became effective on October 1, 2007 and was an expansion of the previous Clean Indoor Air Act of 1975. It bans smoking in enclosed workplaces as well as restaurants, bars and public transit. It includes a number of exemptions to the law and allows local governments to enact stricter laws. The Minnesota Department of Health has a very informative section on the Clean Indoor Air Act. The Minnesota smoking law itself is found in the Minnesota Revised Statutes Chapter 144 Section 411 – 417. Other requirements include posting conspicuous signage for smoking outside of daycare facilities and in private vehicles. The signage must warn others that smoking is allowed. Simply put owners and operators need to post signage in a visible manner that clearly states smoking is not allowed. They should also confirm with local and state offices/officials to ensure any further requirements are met. For a car decal instead of an aluminum sign click on the third template below. Though each template can be changed to any sign type after clicking. Mississippi is in the minority of states in that it doesn’t have a statewide smoking law. Though this to a certain extent is not one hundred percent correct because there is a statewide ban that prohibits smoking in state and local government buildings, including university and college classroom buildings. This is called the Clean Indoor Air Act. Multiple bills have failed to put in a more comprehensive statewide ban. Currently many locales take advantage of the freedom to enact their own smoking bans/prohibitions. Only Indiana and Missouri might rival the number of localities that have these in place. 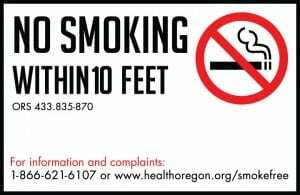 Due to the lack of a comprehensive statewide ban it is absolutely critical that owners and managers determine local laws and ordinances before posting no smoking signage in an effort to prohibit smoking. Missouri, like Indiana and Mississippi, does not have a comprehensive statewide ban on smoking. Though the Clean Air Act still does generally prohibit smoking in a variety of places including enclosed public places, meetings and workplaces. Even then proprietors have quite a bit of power in determining the ability/prohibition to smoke as per the link above. Local governments can restrict smoking and some have put in place their own prohibitions and ordinances. Statewide bans have been repeatedly rejected as Missouri has some of the most permissive smoking and alcohol laws in the nation. The Department of Health has further information on applicable laws here. The actual Clean Air Act is found in the Missouri Revised Statutes Chapter 191 Sections 765 – 777. “6 – How many signs are required? This depends on whether the facility is smoke free, has a Designated Smoking Area, or is an exempted facility. Signs must be easily seen. 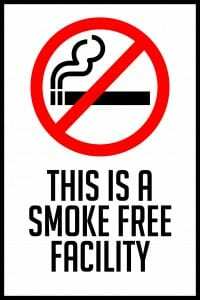 A smoke free facility need only have signs at each entrance into the building stating “This is a smoke free facility” “No smoking allowed” “Thank you for not smoking” or other similar statement. A facility with nonsmoking areas and Designated Smoking Areas must have signs clearly identifying each area, so people clearly understand where smoking is or is not permitted. Due to the absence of a statewide ban it is essential that owners and managers determine local laws and ordinances before posting no smoking signage in an effort to prohibit or allow smoking. The Montana Clean Indoor Air Act went into effect on October 1, 2005. It bans smoking in enclosed workplaces, restaurants, bars, clubs, and casinos. Like almost every other state with a statewide ban there are exemptions to this prohibition. Unlike many other states Montana’s smoking law preempts or disallows localities from enacting more stringent ordinances. Thus, owners and operators need not consult localities but simply the state law as detailed within Montana Code. The Montana Department of Public Health and Human Services also has a number of good resources on the MCIAA. The actual law is found specifically within the Montana Code in Title 50 Chapter 40. 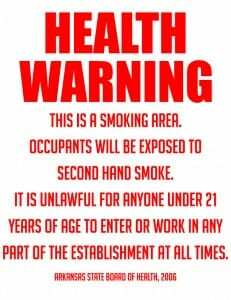 Hotel and motel rooms can also be designated as smoking areas and need signage stating this. In general, owners and operators need to post signage at entrances that clearly state that smoking is prohibited. Nebraska’s statewide smoking ban (Nebraska Revised Statute 71-5716) was enacted on June 1, 2009. It is commonly called the Nebraska Clean Indoor Air Act. The ban, like many others, prohibits smoking in enclosed workplaces. It also includes restaurants and bars and has a number of exemptions built in. Local governments are not preempted by the state smoking law – meaning they can enforce stricter ordinances passed in their locality if they wish. The full law is found in the Nebraska Revised Statutes Chapter 71 Sections 5716 – 5734. Signage requirements come from the Nebraska Department of Health & Human Services as they are given authority to “promulgate rules and regulations” to implement the act in 71-5734 of the the N.R.S. Thus, we would recommend that owners and operators do several things. First, we recommend that signage stating smoking is against state law be posted in a conspicuous manner both at entrances and throughout the location. We recommend that these signs and the manner in which they are posted are not only approved by contacting the Nebraska DHHS but any applicable local authority or office. 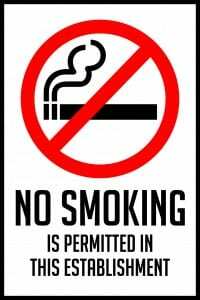 Further, assuming other sections of the law do not outline otherwise, owners and operators may designate non-smoking areas by posting signs prohibiting smoking. Owners, operators and managers should verify that signage posted is not only in compliance with the statewide ban but any applicable local laws or ordinances as well. The Indoor Smoking Act (ISA), New Hampshire’s statewide ban of smoking became effective on September 17, 2007. The ban is applicable to some workplaces, restaurants, bars, hospitals, public educational facilities and a variety of other places. Exemptions number quite a few and include private clubs, hotel and motel rooms, college dorm rooms and more. Further information can be found on the Indoor Smoking Act section of the New Hampshire Department of Health and Human Services website. The full law can be found in the State of New Hampshire Revised Statutes Online Chapter 155 Sections 64 – 78. XVI. “Smoking-permitted area” means an effectively segregated area which is posted with “Smoking Permitted” signs in a building, facility, room, or group of rooms or other enclosed indoor area and in which smoking is allowed, as designated by the person in charge of the facility in accordance with applicable rules adopted by the commissioner pursuant to RSA 155:71. 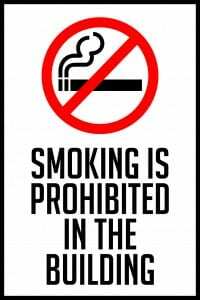 In other words, in addition to clear policies and communication amongst other stipulations smoking areas can be designated assuming there is full segregation and it is clearly denoted as such through posted signage that it is either a smoking or non-smoking area. The law states that “the commissioner” can adopt rules regarding the “size and placement of appropriate signs”. Though the New Hampshire Department of Health and Human Services website doesn’t seem to have any further details regarding posted signage. Nonetheless, owners and managers should verify with the DHHS to ensure posted signage meets requirements. The statewide ban on smoking in New Jersey is called the “New Jersey Smoke-Free Air Act”. 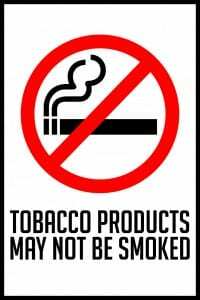 It went into effect on April 15, 2006 and bans smoking in enclosed workplaces, hospitals, bars, restaurants and other places. There are exemptions to the law but fewer than most states. Localities are free to enact more stringent laws and ordinances if they wish. The New Jersey Department of Health also has information regarding the Smoke-free Air Act. 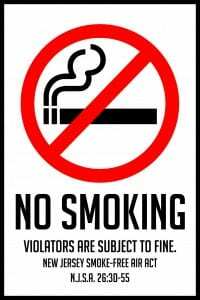 Owners and operators should verify that signage posted meets both state and applicable local laws and ordinances before installing signs permitting or forbidding smoking. New Mexico’s statewide smoking ban that prohibits smoking in all enclosed workplaces as well as bars and restaurants went into effect on June 15, 2007. It also has the largest statewide “perimeter ban” which states that prohibited areas also include a ban on smoking within 50 feet of entrances. The law is commonly known as the Dee Johnson Clean Indoor Air Act. There are a number of exemptions built into the law. Localities are free to enact and enforce more stringent smoking prohibitions assuming state minimums are met. (2) for each indoor workplace or indoor public place where smoking is permitted pursuant to the Dee Johnson Clean Indoor Air Act, a “SMOKING PERMITTED” sign shall be posted where it is clear, conspicuous and easily legible at each public entrance, unless an owner, operator or manager chooses to prohibit smoking in all or part of an indoor workplace or indoor public place where smoking is otherwise permitted. B. Nothing in the Dee Johnson Clean Indoor Air Act shall be construed so as to require the posting of signs at a residence, except during the hours of business operation while it is being used commercially to provide child care, adult care or healthcare or any combination of those activities. 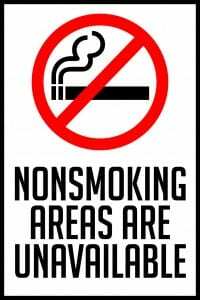 As can be seen above designated smoking or no smoking areas need clear signage denoting the area. Owners and operators should verify with applicable local laws to ensure signage is designed and installed to code. The statewide New York smoking ban prohibits smoking in all enclosed workplaces, restaurants, bars, and construction sites. It has a number of exemptions in place and became effective on July 24, 2003. It doesn’t have a common name but the actual law is entitled “Regulation of Smoking in Public and Work Places.” The state law permits local governments to enact more stringent laws if they wish. The actual New York smoking law can be found in the New York State Laws in the Public Health (PBH) section Article 13-E Sections N-X. The New York Department of Health also has the full text of the law but encourages people to visit the official documentation. Signage requirements are detailed in section 1399-P and are outlined below. the international “No Smoking” symbol, which consists of a pictorial representation of a burning cigarette enclosed in a circle with a bar across it, shall be prominently posted and properly maintained where smoking is regulated by this article, by the owner, operator, manager or other person having control of such area. availability, upon request, of rooms in which no smoking is allowed. Assuming that it is not expressly detailed within the law there is language built in to allow owners and operators to designate smoking and non-smoking areas with proper signage and notice amongst other requirements. 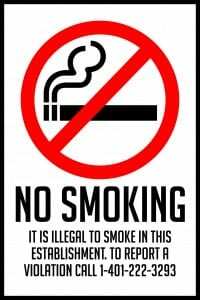 Owners and managers should verify that signage meets state and local laws/ordinances when posting for a smoking or non-smoking area. North Carolina has a statewide ban that prohibits smoking in some workplaces and vehicles as well as bars and restaurants. It became effective on January 2, 2010. Like many other states there are exemptions to the law including private clubs, cigar bars and parts of hotels/motels amongst others. North Carolina has some of the most detailed language as pertaining to the ability of localities in enacting their own laws. These state that cities can create their own laws with approval from the county but are unable to regulate the state exempted locations. In other words, a hybrid of what is usually seen in that they are free to act but with some restrictions. Exact details are found in Section 498 of the law referenced below. The actual law is found in the North Carolina General Statutes Chapter 130A Article 23 Sections 491- 498. The same applies for state vehicles. Owners and operators should ensure posted signage is designed and installed according to both North Carolina smoking laws and local ordinances/laws. North Dakota has a statewide smoking ban which became effective on November 6, 2012 and is called Initiative Measure Four. It is one of the most stringent laws in the nation as it not only bans smoking in enclosed public places and workplaces but also bars, restaurants and tobacco stores. Tobacco stores are generally exempt in most states’ law. Further, it doesn’t allow hotels/motels to designate certain rooms as “smoking”, which most states build into the law. The North Dakota smoking law also prohibits smoking within 20 feet of any entrance/exit of a public or workplace where smoking is banned. Local governments can put in place tougher smoking laws if they wish. BreatheND, which helps implement the law and fight tobacco usage in the state, has a lot of good resources on Initiative Measure Four. The full text of the law can be found in the North Dakota Century Code Title 23-12 Sections 09 – 11. “a. Clearly and conspicuously post no smoking signs or the international no smoking symbol in that place. Previously vehicles that were included in the smoking prohibition also need posted signage but this has changed due to the passing of HB1292 in August, 2013. No specific signage size requirements are detailed in the law. To our knowledge there is no specific language for those wishing to create designated smoking areas. Whether trying to create a smoking area or posting no smoking signage it is recommended that owners and operators contact appropriate state and local officials. The state level Ohio smoking ban has been effective since December 7, 2006. It is called the “Smoking Ban” and includes enclosed workplaces and bars and restaurants. Typical exemptions including designated hotel/motel rooms, tobacco stores and others are built into the law. The Ohio Department of Health is tasked with enforcing the law in section 3794.07 of the actual text of the ban. Local governments can choose to implement stricter laws if they want. Several localities have chosen to do so. The actual law can be found in the Ohio Revised Code Title 37 Chapter 3794. If the symbol is used it must be printed in color. In addition to the above signage requirements owners/managers need to comply with several other non-signage requirements. Likewise, any owner/manager wanting to designate an area as non-smoking must meet the signage requirements as outlined above in order to enforce a non-smoking ban for specific areas. 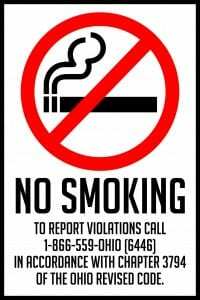 Owners and operators should verify with the Department of Health and any local offices for specific signage requirements that may be necessary above and beyond what is detailed in the Ohio smoking law as noted above. Oklahoma is in the minority in that it doesn’t currently have a statewide ban on smoking. It does though still generally prohibit smoking in indoor workplaces and restaurants and hotels with exemptions in place for some of these locations according to certain stipulations. Further exemptions to the the current smoking law(s) also exist. Prior attempts to strengthen the statewide law into a full ban have failed. Oklahoma’s current law falls into the group of states that explicitly state that localities are not able to create their own laws. This principle is known as preemption. It is very confusing where to find the official text of the current Oklahoma no smoking law. At the very least pertinent information can be found in the Oklahoma Statutes starting in Title 21 Section 1247 and Title 63 Section 1-1521. Another good two page summary is here. The summary linked to above lists the other requirements needed to make a non-smoking area a smoking one. Doing so assumes it isn’t explicitly prohibited in the law and meets the same signage requirements as above. With only the state law in place this should be all the signage requirements that need to be met. Nonetheless, we recommend contacting the appropriate authorities whenever there might be questions to ensure signage is to code. Clicking on the template below will default to a decal though the “Sign Type” can be changed to anything after clicking. Oregon’s statewide smoking ban became effective on January 1, 2009. This law was amended from the original smoking law put in place in 1981. It is called the Oregon Indoor Clean Air Act or sometimes “Oregon’s Smokefree Workplace Law”. The Oregon Health Authority is tasked with adopting rules to implement the law as well as enforcing compliance. The ban covers all enclosed workplaces, restaurants and bars. It also has a “perimeter” ban of 10 feet from entrances/exits and windows of these locations. Like almost all other states the ban includes exemptions (i.e. portions of hotels/motels) of certain locations and local governments are free to enact more stringent ordinances/laws as they see fit. The actual Oregon smoking law itself is found in the Oregon Revised Statutes (ORS) Chapter 433 Sections 835 – 875. The Oregon Health Authority also has many good resources on the state law. There doesn’t seem to be any language regarding how an owner or operator can create a smoking area or even a non-smoking area beyond the prohibited or exempted areas as outlined in the law. We would recommend contacting the Oregon Health Authority on this. Likewise, it is recommended that those posting signs contact local authorities to verify there is not a stricter local law or ordinance. Like Oregon, Pennsylvania has a statewide smoking ban that was recently adopted and amended an older existing law. The older law was Pennsylvania’s 1988 Clean Indoor Air Act (CIAA). The newer law (also commonly referred to as “Act 27 of 2008”) became effective September 11, 2008 and prohibits smoking in enclosed workplaces and most restaurants. The law exempts bars, casinos, some restaurants and portions of hotels/motels amongst other specific places and situations. Interestingly, localities may not enact their own ordinances throughout the state except for the city of Philadelphia. No reasons is given for why only Philadelphia is excluded from the state law’s preemption. Though it may have to do with the fact that Philadelphia had a smoking ban in place before the state law was enacted. The actual text of the Pennsylvania smoking law is near impossible to find in the official code or statutes of the state. There is the text of the law found on the Pennsylvania General Assembly’s website calling it: P.L. 182, No. 27. The Pennsylvania Department of Health also has a variety of resources and information on the current law. As noted above Philadelphia has their own smoking ban. Thus, owners and operators outside of Philadelphia can post signage that meets the above requirements. 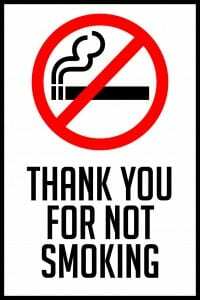 Those within Philadelphia should ensure that any signage meets the city’s smoking ban put in place January 8, 2007. Rhode Island’s smoking ban prohibits smoking in all enclosed workplaces as well as bars and restaurants. It is called the “Public Health and Workplace Safety Act” and became effective March 1, 2005. It includes a variety of exemptions to the law and allows localities to enact more stringent laws. The full text of the Public Health and Workplace Safety Act can be found in the Rhode Island General Laws Title 23 Chapter 20.10. “(a) “No smoking” signs or the international “No smoking” symbol (consisting of a pictorial representation of a burning cigarette enclosed in a red circle with a red bar across it) shall be clearly and conspicuously posted in every public place and place of employment where smoking is prohibited by this chapter, by the owner, operator, manager or other person in control of that place. Signs required by this chapter may be provided by the state department of health at cost. (b) Every public place and place of employment where smoking is prohibited by this chapter shall have posted at every entrance a conspicuous sign clearly stating that smoking is prohibited. With no localities, to our knowledge, having adopted more stringent local laws owners and operators need to comply with the no smoking signage requirements above. Questions can be directed to the Rhode Island Department of Health or even local officials if signage requirements of the smoking law are unclear. South Carolina, like a handful of other states, has no statewide ban on smoking but does have an older law that regulates some smoking. The older South Carolina smoking law, The Clean Indoor Air Law (or the “Clean Indoor Air Act of 1990”) passed in 1990, generally prohibits smoking in public schools, child and healthcare facilities, government buildings, elevators, public transportation and public theaters and arenas. Likewise, similar to other states that don’t have a statewide ban repeated attempts to enact such a law at the state level failed. Lastly, many localities have enacted their own more stringent laws in the absence of a statewide ban. It should be noted that in addition to signage there are other requirements at the state level for creating smoking areas and the state law should be consulted when doing so. While the state signage requirements are few, with so many localities (here is a PDF showing these as of January 2013) having enacted their own ordinances (most of which include businesses, restaurants and bars) owners and operators should contact local offices and officials to ensure signage meets applicable requirements. The statewide South Dakota smoking ban went into effect on November 10, 2010 and is commonly referred to as H.B. 1240. The ban prohibits smoking in all enclosed workplaces including bars and restaurants. The ban includes a number of exemptions to the smoking prohibition. The law itself doesn’t say whether localities may or may not enact their own laws. To our knowledge none have created more stringent laws to date. The actual text of the South Dakota smoking law can be found in South Dakota Codified Laws Title 34 Chapter 46 Sections 13-19. South Dakota has one of the least clear policies in terms of signage required for no smoking environments. As seen above it simply states that one “has to inform persons of the provisions”. Thus, we highly recommend owners and operators contact both appropriate state and local offices to ensure no further signage requirements are in place. Tennessee’s statewide smoking ban became effective on October 1, 2007. It is known as the “Non-Smoker Protection Act”. It bans smoking in enclosed workplaces and has a number of exemptions including some restaurants, bars, adult-only venues, portions of hotels/motels as designated and more. The Tennessee law uses the preemption principle to forbid localities from enacting their own laws. The Tennessee Department of Health is tasked with enforcement, complaints etc. The DOH also has lots of good resources for business owners and other related to the ban. The actual text of the Tennessee smoking law, the Non-Smoker Protection Law, can be found in the Tennessee Code Title 39 Chapter 17 Part 18. “ (a) “No Smoking” signs or the international “No Smoking” symbol, consisting of a pictorial representation of a burning cigarette enclosed in a red circle with a red bar across it, shall be clearly and conspicuously posted at every entrance to every public place and place of employment where smoking is prohibited by this part by the owner, operator, manager, or other person in control of that place. As noted above with the state law preempting the ability of localities to enact laws the above requirements should be sufficient. Notwithstanding, there is no clear language on an owner or manager’s ability to create designated areas (smoking or non-smoking) beyond what is outlined as prohibited and exempted areas. These questions should be directed to the Department of Health. Texas currently does not have a statewide smoking ban but does have various smoking regulations that prohibits smoking in a variety of places. Some of these include: public schools, hospitals, public transportation, libraries and more. The law itself doesn’t say whether localities may enact their own smoking bans or not. In the absence of such language, more than 75 Texas localities have enacted such laws, many of which ban smoking in all enclosed workplaces, bars and restaurants. Like other states without a statewide ban repeated attempts at enacting a state law have failed. As far as we can tell there is not one specific location where Texas smoking laws can be found. Rather they are dispersed throughout Texas Code. The Texas Department of Health has a list of tobacco related laws here. We were unable to find any specific state signage requirements in Texas Code. We would assume that like many other states some kind of generic “No Smoking” sign is necessary. We would recommend posting them at entrances/exits and in conspicuous places as this is what most states require. Though the best recommendation we can give is to contact your local Department of Health and verify your local smoking ordinances as many Texas cities/counties have enacted such laws and have specific signage requirements. Utah’s original 1995 Indoor Clean Air Act was expanded to what is today a statewide smoking ban. It has been effective since January 1, 2007 and was amended in 2012. It bans smoking in all enclosed workplaces, bars and restaurants. The ban also includes a 25 feet perimeter ban. 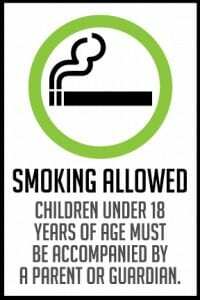 There is also a separate statute that forbids smoking in a car when a child under the age of 15 is present. Like almost all other states with a statewide ban it includes exemptions though these are fewer than most states. The state level Utah smoking law preempts local governments from passing their own more stringent smoking ordinances. The Utah Department of Health is in charge of enforcing the actual law. Utah is also unique in that in addition to the statute as listed below smoking regulations are also found in Rule R392-510. The combination of these two constitute the smoking regulations within Utah. The statute can be found in the Utah Code / Constitution Title 26 Chapter 38. Alternatively, Rule R392-510 has extremely detailed information including a specific section, R392-510-15, for signage requirements and public announcements. Apart from the specific section outlined below, Rule R392 notes that owners and operators may prohibit smoking anywhere indoors or outdoors on their premises assuming certain stipulations are met. “Signs required in this section must be easily readable and must not be obscured in any way. The words “No Smoking” must be not less than 1.5 inches in height. If the international “No Smoking” symbol is used alone, it must be at least 4 inches in diameter. (1) In a place where smoking is prohibited entirely, the building owner, agent, or operator must conspicuously post a sign using the words, “No smoking is permitted in this establishment” or a similar statement, which shall also include the international no-smoking symbol, on all entrances or in a position clearly visible on entry into the place. 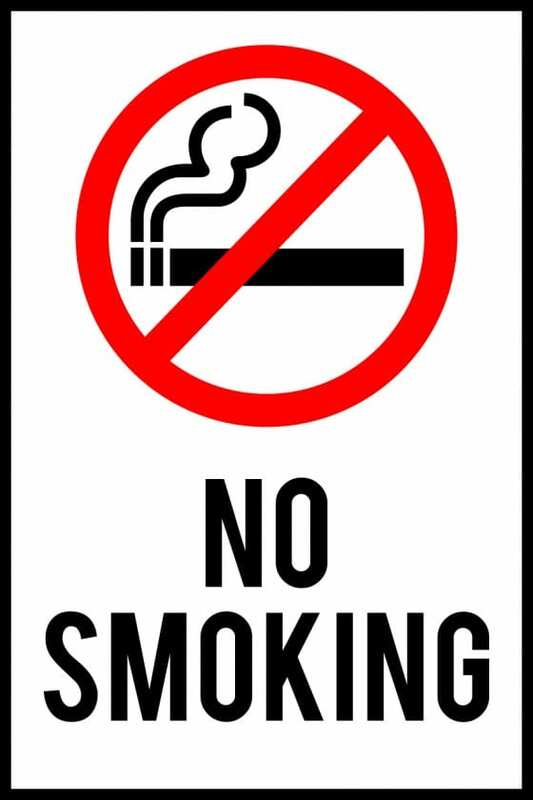 (2) In a place where smoking is partially allowed, the building owner, agent, or operator must conspicuously post a sign using the words, “No smoking is permitted except in designated areas” or a similar statement, which shall also include the international no-smoking symbol, on all entrances or in a position clearly visible on entry into the place. 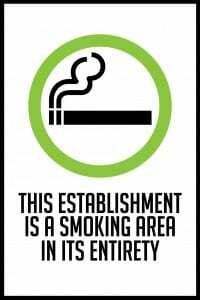 (3) In a place where smoking is allowed in its entirety, the building owner, agent, or operator must conspicuously post a sign using the words, “This establishment is a smoking area in its entirety” or similar statement. 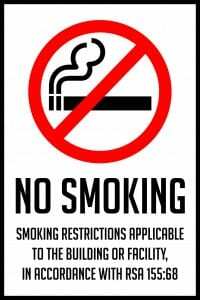 (4) The building owner, agent, or operator must post a sign at all smoking-permitted areas provided for under Section 26-38-3(2)(a), (b),and(c). 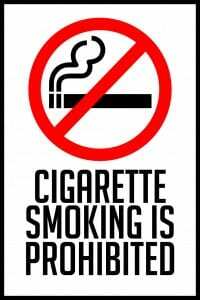 The sign must have the words, “smoking permitted” or similar wording and include the international smoking symbol. 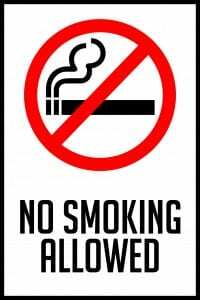 (5) The building owner, agent, or operator must post a sign inside the exit of all smoking-permitted areas, if the exit leads to a smoking-prohibited area. 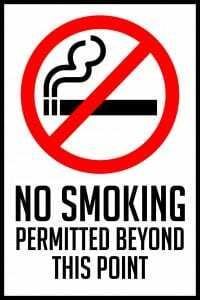 The sign must have the words, “smoking not permitted beyond this point” or similar wording and include the international no-smoking symbol. (6) In public lodging facilities that designate guest rooms as smoking allowed, the building owner, agent, or operator must conspicuously post a permanent sign on the smoking-allowed guest room door and meet the requirements of R392-510-6(1) and (2). (7) In nursing homes, assisted living facilities, small healthcare facilities and hospitals with a certified swing-bed program that designate private residential sleeping rooms as “smoking allowed,” the building owner, agent, or operator must conspicuously post a permanent sign on the door and meet the requirements of R392-510-6(1) and (2). (a) If smoking is not permitted, the announcements shall convey that the Utah Indoor Clean Air Act prohibits smoking in the place. (b) If smoking is partially permitted, the announcements shall convey that the Utah Indoor Clean Air Act requires smokers to smoke only in those areas specifically designated for smoking. (10) The building owner, agent, or operator of a large place, such as an airport, university, hotel or motel, or sports arena may, in writing, request the assistance of the local health officer to establish an effective signage and public announcements plan. The local health officer may cause the plan to be modified at any time to protect nonsmokers from being exposed to tobacco smoke. (11) Buildings that are places of worship operated by a religious organization are not required to post signs. Further, signage is required for temporary exemptions as outlined below. “(1) The building owner, agent or operator must conspicuously post signs that are easily readable and not obscured in any way as outlined in R392-510-12. The words must not be less than 1.5 inches in height. 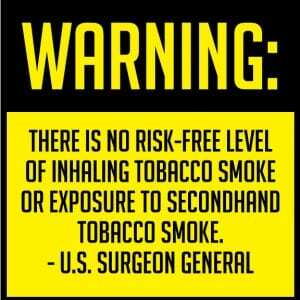 The signs shall state “WARNING: There is no risk-free level of inhaling tobacco smoke or exposure to secondhand tobacco smoke. -U.S. Surgeon General“. (2) The sign shall be posted at all entrances or in a position clearly visible on entry into the place. With the very detailed requirements laid out above and preemption in place owners and operators should be able to meet all necessary signage requirements without contacting public officials or offices. Vermont’s statewide smoking ban (called the “Clean Indoor Air Act”) includes all enclosed workplaces, bars and restaurants. It has been effective since September 1, 2005. The ban does include some exemptions but is the only state to not exempt hotels/motels. This summary notes that workplaces are literally 100% smoke free and can’t even have areas designated as smoking permitted areas. This became effective after a 2009 amendment to the law. Vermont allows local governments to create more stringent ordinances if they wish. Several have done so to this point including its most populous city, Burlington. The actual Vermont smoking law can be found in The Vermont Statutes Title 18 Chapter 37. It may be the shortest no smoking law in the nation. It doesn’t include an explicit section nor any mention on signage. The Department of Health “recommends” that the 100% Smoke-Free poster provided by them be posted in workplaces. Despite this recommendation there is still no specific language for creating smoking areas outside or any other regulations at the state level for posting signage in prohibited areas. Owners and operators should verify with any local ordinances that may require signage in specific situations or locales. Virginia’s initial smoking law was the 1990 Indoor Clean Air Act. Effective December 1, 2009 it was amended to be a statewide ban on a variety of locations including some workplaces and restaurants and bars except for the latter two where there is a structurally separate area that also has separate ventilation. The ban includes a number of exemptions including private clubs, tobacco related facilities and more. Virginia’s state law preempts the ability for local governments to enact their own more stringent laws or ordinances. Virginia has also banned smoking in state related buildings by executive order by the Governor. The Virginia Department of Health has a number of good resources on the smoking ban. The actual Indoor Clean Air Act is found in the Code of Virginia Title 15.2 Chapter 28.2. With preemption in place owners and managers should be able to adhere to signage laws by following what is outlined above. Further questions can be directed to the Virginia Department of Health. Washington, like several other states has a statewide smoking ban that is the amended version of a much older original law. In Washington’s case the initial law was the 1985 Clean Indoor Air Act and the new law became effective on December 8, 2008. The new law is titled “Smoking in Public Places” in the actual law and bans smoking in public places (including bars and restaurants) and workplaces and has exemptions for a variety of location and situations. The ban also includes a 25 feet perimeter ban from locations that prohibit smoking. This 25 feet ban applies to not only entrance/exit doors but windows and ventilation systems as well. Likewise, similar to many states Washington allows local governments to enact more stringent laws and has the Department of Health (state or local depending on the law) to enforce the ban. The DoH runs the Smoke Free Washington website that has a lot of good resources on the law, compliance and more. The actual Washington smoking law is found the Revised Code of Washington Title 70 Chapter 70.160 (RCW 70.160). Owners and operators should ensure any signage meets both state and local laws as the state law doesn’t preclude local governments from creating their own laws. West Virginia falls into the category of states who don’t technically have a statewide ban but do have smoking laws that generally prohibit smoking. These prohibitions apply to public transit, public schools, workplaces, mining operations and more. In several of these cases signage plays a critical role. At least one previous attempt to enact a statewide ban failed. West Virginia laws do not preempt enacted local laws and many localities have adopted more stringent smoking laws. West Virginia state smoking laws are not found in one specific place. Rather they are spread throughout the state code and signage requirements that we could find are listed below. There are also similar signage requirements for mining environments and designated areas in bingo halls. Because signage requirements are not consolidated into one place within West Virginia Code we highly recommended that owners and operators work with the state Department of Health as well as check with applicable county and city codes to ensure signage meets specific requirements. There is a great map on the West Virginia Health & Human Resources’ division of Tobacco Prevention website that helps verify these laws. Wisconsin’s statewide smoking ban became effective on July 5, 2010. It is commonly referred to as 2009 Wisconsin Act 12 and amends the prior Statute 101.123 (“Clean Indoor Air Act”). It bans smoking in all enclosed workplaces, bars, restaurants and more. 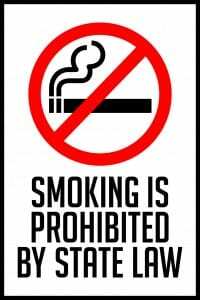 It also includes a “perimeter ban” of a “reasonable distance” banning smoking within a safe distance of most buildings that fall under the prohibition. It include exemptions like other states but are fewer in number than most states. The law for the most part allows any local government from enacting more stringent legislation related to smoking. Wibettersmokefree.com has lots of good resources on the law. 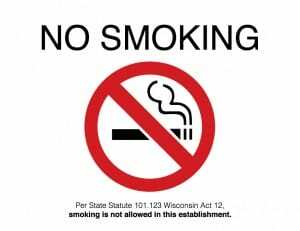 The actual text of the Wisconsin smoking law appears in Statute 101.123 and more details of 2009 Wisconsin Act 12 can be found in this Legislative Briefs article. Notwithstanding the information above due to the lack of specific signage requirements detailed in the law owners and operators should verify with the Wisconsin Department of Health as well as any applicable local authorities as to any additional signage specifics. Wyoming does not have a statewide ban. Not only does Wyoming not have a statewide ban but it is unique in that it has very few general no smoking laws. Other states who do not have a statewide ban generally have a number of different laws that still regulate smoking. Wyoming’s “other” laws only prohibit smoking where it could cause an explosion and in underground mines. It literally has no laws governing indoor smoking at the state level. Though like many other states it does allow local governments to enact their own smoking laws as they see fit. At least one previous attempt to enact a state ban failed to get past the Wyoming Senate. 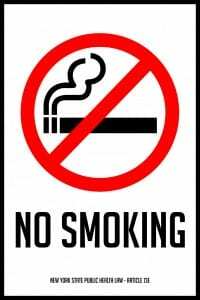 Due to the fact that there aren’t any state laws regarding smoking we recommend that owners and operators verify with appropriate local authorities in regards to any potential no smoking signage guidelines.